Cuba is considered a promising growth energy market in the Americas. Domestic supply increases are expected in the coming years. In addition, rising local demand and trading opportunities could also be attractive to energy companies. However, political factors may be as important as economic forces in the coming years. United States economic sanctions against Cuba limit for now the country’s potential as both an energy supplier and growth user market. Were these sanctions eased, Cuba’s energy sector would benefit greatly from its strategic proximity to the important U.S. market. The Cuban economy is still suffering from the aftermath of the collapse of the Soviet Union, which provided generous economic subsidies including cheap energy supplies. To alleviate the economic downturn that began in the early 1990s, Cuba has introduced some market-oriented reforms to supplement its command economy structure. The reforms, which include opening the economy to tourism, decentralizing agriculture and authorizing self-employment in 150 occupations, are likely to pave the way for both increased energy use and a shift in distribution of energy use by sector. Cuba has invited foreign private investment in a variety of industries including its energy sector. Several firms have explored for oil and gas off Cuba’s coastline but with only limited success. Cuba’s refining sector is also in need of investment and upgrading. Despite U.S. sanctions, several European, Canadian and South American energy firms have investigated the possibility of making investments in Cuba’s energy sector, anticipating an expanding market even without exports to nearby U.S. markets. Were U.S. economic sanctions to be eased, the growth potential of the Cuban energy sector would be even greater. This paper investigates the state of Cuba’s energy sector and its future trends. Attention is given to the impact that an easing of U.S. sanctions against Cuba could have on its energy sector. 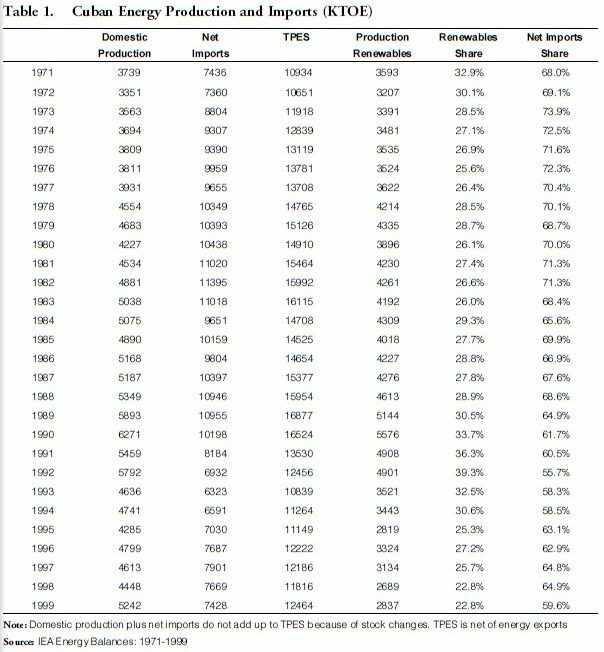 Total primary Cuban energy supply (TPES), that is total energy used including process losses, rose from 10,934 thousand tons of oil equivalent (KTOE) in 1971 to a peak of 16,877 KTOE in 1989 before beginning a general descent following the cut-off of Soviet aid (see Table 1). After hitting a 20 year low in 1993, total primary Cuban energy supply recovered to 12,464 KTOE in 1999. In addition to hydrocarbons, renewables and waste such as sugar cane biomass, windmills, solar and small hydro-powered generators have accounted for a substantial, although declining share of energy supply. Their share of TPES declined from 32.9% in 1971 to 22.8% in 1999. Some 60% of total primary energy supply is imported. Production of oil has steadily increased but in 1999, 80% of petroleum and petroleum products were imported. According to the U.S. Department of Energy (U.S. DOE, June 2002), Cuba generated 13.3 quadrillion BTUs of electricity in 1998, of which 94% came from thermal powered generators. Hydroelectric power is miniscule, accounting for less than 1%. Almost all Cuban households (95%) have electricity, accounting for 36% of total electricity consumption in 1999. Approximately 100 thousand cubic meters of natural gas were also consumed by households (in Havana) in 1997 (Werlau, 1998). Table 1 shows net energy imports rather than total imports. For most years there is little difference. However, during the 1980s Cuba re-exported Soviet oil. In 1985, these exports amounted to roughly 3,500 KTOE. Exports declined to 2,700 KTOE in 1989 and then ceased in 1990. The collapse of the Soviet Union and the end of Soviet aid to Cuba have had a dramatic impact on Cuba’s economy in general and on its energy sector in particular. Energy demand was curtailed to the largest extent in the sectors involving private usage such as the transportation sector and to a lesser extent, the residential electricity sector. Electricity blackouts were common during the transition period. Table 1 shows the effect of the collapse of the Soviet Union and end of Soviet aid on energy imports and supply. Net imports fell sharply from 13,626 KTOE in 1989 to 8,184 KTOE in 1991—almost 40%. TPES fell only 20%, reflecting the importance of renewables and waste products in Cuban energy supply. Imports dropped a further 23% from 1991-93 while TPES decreased another 20%. TPES regained some of that loss by 1996. However, TPES in 1999 was essentially the same as it was in 1996. Figure 1 shows the typical pattern of end use energy demand estimated by Medlock/Soligo using data from Latin American countries plus Canada and the U.S. (Although the data are from different countries, the pattern is similar to that for a data set of non-Latin American countries). 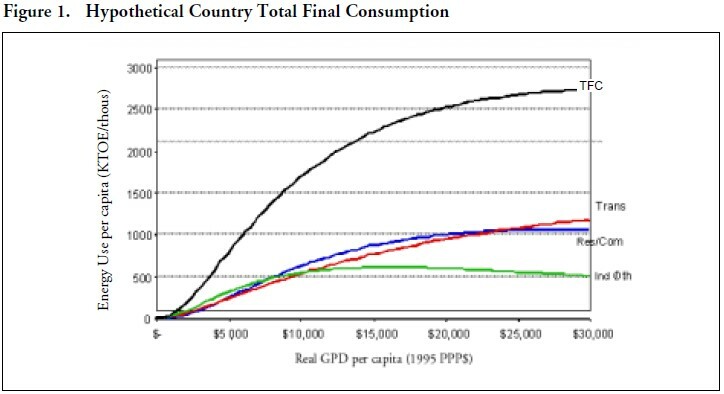 Per capita energy use (KTOE per thousand persons) is plotted against per capita income measured in 1995 PPP dollars. In the early stages of development, energy use by the industrial sector rises rapidly as countries begin to industrialize. At some stage of development, this process slows down and energy use in the industrial sector levels off. However, per capita energy use in the transport and commercial/residential sectors continues to increase, eventually overtaking consumption in the industrial sector. In the long run, the demand for energy is inelastic with respect to changes in per capita GDP. That is, the demand for energy, per capita, rises at a slower rate than output. However, at low levels of per capita income, this elasticity is greater that unity. Countries at specific levels of per capita income will deviate from the predicted level of energy use to the extent that there are differences in climate, population density, energy taxes and other policies that affect energy prices and investments in transportation infrastructure. The Medlock/Soligo model has been estimated using data from market economies. Placing Cuba into this framework requires some adjustment because Cuba has been and generally remains a “command” economy. As such, the level and composition of energy use has not followed the pattern of development experienced by more market-oriented economies. In particular, private motor vehicle ownership is substantially lower in Cuba than in other countries with comparable per capita incomes, reflecting the different priorities of the planning authorities and possibly, the more equal distribution of income. Given the energy use characteristics of the Cuban economy, how do we estimate future Cuban energy consumption? Will Cuba be able to hold energy intensity relatively constant as GDP continues to grow? In our opinion, this latter possibility is unlikely in the non-manufacturing sectors. Energy consumption has been severely repressed during the past decade. As per capita income grows, the public will demand better public, if not increasing access to private, transportation and more consumer durables. Also, as tourism, the primary engine of growth, continues to increase, demand for transportation fuels and electricity will similarly grow. Tourists will demand access to air conditioned hotels and restaurants (especially important given Cuba’s climate) and rental cars or transportation by taxi. Tourism to Cuba has been growing rapidly as appropriate infrastructure has been built. The number of hotel rooms increased from 10,000 in 1988 to over 32,000 in 1999 (Crespo and Suddaby, 2000, p. 353). In nominal terms, revenues from tourism have grown fromUS$243 million in 1990 to US$2 billion in 2000, an increase of over 700%. During 1999-2000, gross income from tourism to Cuba grew by 8.1% (ECLAC, 1999-2000) despite the restriction on travel by U.S. citizens. In 1998, U.S. tourists accounted for 60% of all tourists to other Caribbean islands. Without the embargo, ordinary Americans would be free to travel to Cuba possibly adding an additional $1 billion to Cuban tourist earnings within a few years (Preeg, 1998). In generating some estimates of future energy demand in Cuba, we use the Medlock/Soligo model, mindful that this model has been estimated using data from market- economies. 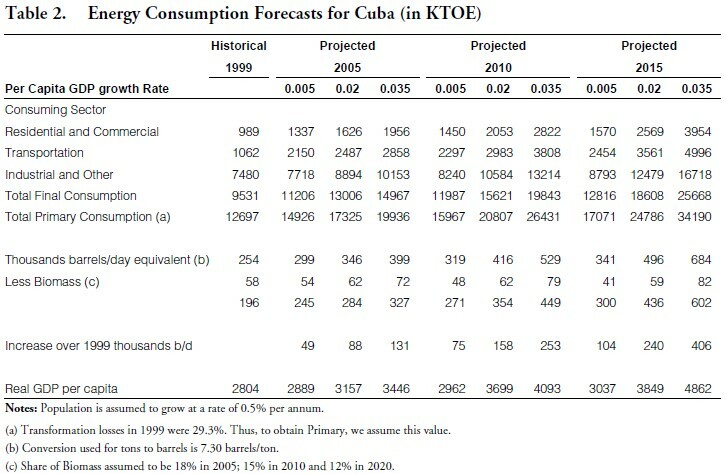 In forecasting future energy demand for Cuba a critical assumption concerns whether or not Cuba will move towards a more market oriented economy where investment and output decisions reflect consumer preferences to a greater degree than in the past. At this point, significant reforms towards a more open, market-oriented economy do not appear to be imminent. On the other hand, it does seem reasonable to assume that the Cuban economic model will eventually evolve towards at least a market economy, be it socialist or capitalist, where consumer preferences will have a larger effect on resource allocation. In applying the Medlock/Soligo modeling approach to Cuba, it is necessary to make some assumptions about future growth rates in per capita income. Cuban GDP growth has recently averaged about 4 per cent per annum, equivalent to a per capita growth of roughly 3.5%. If per capita income were to continue to grow at this rate, per capita income in 2010 will increase from 1999 levels by 46% and in 2015, by 74%. By 2010, Cuban per capita income in 1995 PPP dollars would be only 76% of the 1999 level for the Dominican Republic. By 2015, it would be $4862, still only 97% of the 1999 Costa Rican level of $7731. Clearly, the future growth rate for Cuba will depend on a number of factors including future U.S. policy towards the island. Removal of sanctions will increase the rate of growth, more so if the Cuban government encourages trade and investment with the U.S. Growth prospects are higher if sanctions are removed and foreign relations are normalized within the context of the current political regime so that property claims and other contentious issues can be dealt with in a stable and orderly manner. A chaotic transition accompanied by civil strife and a struggle to assert old property claims could seriously set back growth and development. We have used 3.5% as the upper bound on future per capita income growth rates. This is a fairly high rate compared with experience in other Latin American cases. It is equivalent to the 4% growth rate that Cuba has experienced in the latter half of the 1990s (with population growth at .5%) but that growth rate might reflect the fact that Cuba was rebounding from the repressed levels of GDP experienced in the early 1990s. A more realistic per capita growth rate is 2%, especially over a longer period of time. As a lower bound, we assume a growth rate of 0.5%. Table 2 shows projections for total energy consumption by end-use sector, total primary energy demand and, finally, total primary energy less biomass, as projected by the Medlock/Soligo model. This final number represents the energy that must be supplied by hydrocarbon sources, mainly oil and to a lesser extent, natural gas. For all of the scenarios studied, it is assumed that the Cuban population will increase by a total of 8% between 1998 and 2015, roughly the same rate of growth (about 0.5% per annum) as experienced in the 1990s. Projections yield estimates for 2015 of between 300 and 602 thousand barrels a day of (b/d) oil equivalent, an increase in consumption over 1999 levels of 104 to 406 thousand of b/d of oil equivalent. This is the energy requirement that would have to be supplied by non-biomass sources, principally oil and natural gas. Forecasts of future energy consumption also indicate a significant change in the composition of demand by end-sector (see Table 3). In particular, demand from the transport sector will grow much more rapidly than in other sectors. 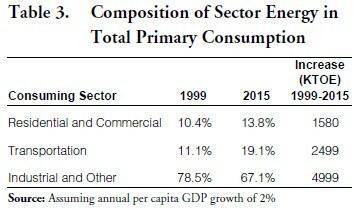 Assuming an annual per capita growth of 2%, the industry/other sector shows the largest increase in consumption but its share of total final consumption declines from 78.5% to 67.1%. The transportation sector shows the second largest absolute increase in demand but experiences an increase in its share of TFC from 11.1% to 19.1%. The residential/commercial sector shows the smallest increase in demand but its share also increases. It should be emphasized that these are conservative estimates in the sense that they do not assume a rapid adjustment of the structure of the Cuban economy that might accompany a change in the economic model. Rather, the projection take the existing structure of demand and assumes that demand will change over time, in response to increases in per capita income, following the pattern of other developing economies. To summarize, we project that Cuban energy needs will increase by 104,000 b/d-406, 000 b/d by 2015. With a per capita income growth rate of 2%, the additional requirements would be 240,000 b/d. This increase will have to be met by additional imports or increases in domestic production of crude or natural gas. In absolute terms, the industrial and other sector will show the largest increase in consumption. But in relative terms, it is the transport sector that will show the greatest increase in demand. To meet Cuba’s rising energy needs, its current industry will need to be significantly expanded. Otherwise, the country’s import bill will increase substantially. Cuba has proven crude oil reserves of about 750 million barrels, while its proven natural gas reserves total 2,500 billion cubic feet (U.S. DOE, June 2002). Due to its limited natural resources, Cuba is dependent upon oil imports to meet about two-thirds of its 190,000 b/d domestic needs. In 2000, Cuba produced about 46,500 b/d of crude oil, mostly from the north central coast in the state of Matanzas, and 600 million cubic meters of natural gas. State oil firm Cubapetróleo (Cupet) has also recently suggested that it plans to boost output to 120,000 b/d by 2005, though those figures appear speculative in light of recent exploration disappointments. Between 1991 and 1999, foreign investment in oil exploration and production in Cuba increased by about $600 million. Roughly half a dozen foreign companies are currently active in Cuban waters, either exploring for or producing oil, despite the threat posed by the Helms-Burton Act. Industry experts believe that the Cuban sector of the Gulf of Mexico could contain as much as 3 to 4 billion barrels of recoverable reserves, mainly in deeper waters. One of Cuba’s largest oil fields, the Varadero field, has an estimated 2 billion barrels of oil in place. The benefits of a successful Cuban oil and gas offshore sector to the U.S. are large given its proximity to Florida markets. If the introduction of superior drilling technology and methods by the U.S. industry or large supermajors could increase the chances for increased exploration success in Cuba, it would enhance U.S. energy security and supplement an increasingly downgraded outlook for other Latin American supplies. At present, Florida can purchase natural gas supplies from the U.S. Gulf of Mexico via Florida Gas Transmission (FGT), an existing pipeline system running from Texas. The capacity of this onland Gulf coast pipeline is being expanded and is expected to grow to 2.2 billion cubic feet/day (bcf/d) by the end of 2003, up from 1.66 bcf/d currently. The U.S. Federal Energy Regulatory Commission (FERC) has also given its final certification for the $1.6 billion, Duke Energy/Williams Gulfstream pipeline project that will carry 1.13 bcf/d from supply areas in Alabama and the Gulf coast to the Tampa area via a 744 mile underwater pipeline. The Tampa landing point will connect by pipeline across the state to Palm Beach. An LNG terminal at Elba Island, Georgia, is also slated to reopen shortly, with a pipeline connection to Florida through the Cypress Pipeline. The new projects do not appear to be oversubscribed with customers at the moment. Demand for natural gas in Florida is expected to grow significantly in coming years from just under 1.5 bcf/d in recent years to 2 to 4 bcf/d between 2005 and 2015, according to industry estimates. Much of the seasonal rise in energy use in Florida is now met by imports of refined oil products but this could change over time as more natural gas could be made available to the state, potentially lowering energy costs during periods when international oil prices are rising. If a significant level of natural gas supply could be made available from Cuban waters by pipeline into Florida, the Cuban supply would enhance competition in the Florida market. The addition of additional Cuban sellers with the incentive to market the bulk of their supply to Florida will prompt a lowering of prices so that these additional sellers can find a market for their supplies by increasing the quantity demanded. The economics for Cuban natural gas supplies are not likely to be all that different from Texas and Alabama gas. Drilling and other finding costs will likely be similar to deepwater plays along the U.S. Gulf of Mexico and could be lower if Cuba offers more attractive fiscal and royalty terms, depending on the size of any finds and the amount of liquids associated with the natural gas. Pipeline costs to Florida are unlikely to exceed 40 to 50 cents per mcf even for a relatively small discovery of 200 mmcf/d, assuming a 15% rate of return over a 20-year operating period with operating costs of 3% capital cost. This is in line with transportation costs for existing pipeline infrastructure from natural gas trading hub and storage area Henry Hub and amortized costs for the Gulfstream project. Table 4 shows how average Cuban costs might stake up against the costs of competing supplies to Florida. The costs in Table 4, however, do not fully reflect the competitiveness of Cuban natural gas. That’s because Cuban supplies would likely to be “associated” gas and therefore could presumably be priced to the market. Revenue from related oil production from Cuban fields would offset the fixed costs of drilling and producing any associated natural gas, allowing Cuban producers to price natural gas closer to marginal production costs. Cuban sellers, having transportation linked solely to the Florida market, would be likely to undercut other suppliers to maintain market share, creating a competitive market structure and contributing to lower prices to the state. The Cuban energy market continues to be of interest to European and Latin American energy firms. While the growth potential is not considered large, the country’s geographic position near to expanding markets in the U.S. and Mexico make it an interesting possible entrepot for energy project development. Overall growth possibilities of around 104,000 to 406,000 b/d of oil equivalent by 2015 still represent a solid business opportunity for regional players. There will also be opportunities for investment in the electric power industry. Electricity use in the residential/ commercial/public service sector alone is expected to grow by 47% by 2010 and 59% by 2015 under the 0.5% per annum per capita growth scenario. With 2% growth, electricity demand would increase by 108% and 160% respectively. In 1999, the sector consumed over 61% of total electricity consumed. Of the 4.34 gigawatts of installed capacity, some 2.65 were devoted to satisfying demand for this sector. Hence, expected growth in demand from this sector alone could require the addition of from 1.2 to 2.9 gigawatts of additional capacity by 2010, depending on whether per capita income growth were 0.5% or 2% per annum. By 2015, the required additional capacity would range from 1.6 to 4.2 GW. The Cuban government has been working to upgrade its refining system to be able to accommodate a blend of imported and domestic crudes. The country has four refineries with nameplate capacity of about 301,000 b/d, with two units, one in Havana (122,000 b/d) and the other in Santiago de Cuba (100,000 b/d), accounting for the bulk of that capacity. A smaller refinery in the Ciego de Avila province produces about 2,000 b/d of lubricants for the local market. The 76,000 b/d Russian-built Cienfuegos plant, designed in the early 1990s to handle Russian shipments, was not brought on stream due to the collapse in supplies from the former Soviet Union. An estimated $250 million is required to bring it into service. A number of foreign oil firms have been in onagain, off-again discussions with Cuba about establishing joint ventures to reactivate the unit. Were U.S. restrictions to be lifted, Cuba would be an ideal entrepot for energy trading, in refined oil products, natural gas processing and distribution facilities and crude oil storage for shipments to the U.S. and possibly Mexico. Already, several Caribbean islands play this transshipment role. The Caribbean currently houses independent petroleum storage facilities with a capacity of approximately 100 million barrels of crude oil and refined products tankage. The U.S. imported over 580,000 b/d from the Caribbean in 2001, almost 90% of which was refined products from the Virgin Islands, the Netherland Antilles, Trinidad and Tobago and Puerto Rico. With U.S. refining capacity reaching its limits to meet rising U.S. demand for oil products, and with environmental restrictions making construction of new U.S. domestic facilities unlikely, Caribbean refining ventures remain a promising option for supplying growing future U.S. refined products demand. The changing pattern in energy demand in Cuba reflects both shifting economic policies as well as the consequences of an end to economic assistance from the USSR. Given recent growth rates and the rapid development of a tourist industry, we believe that per capita income growth of 0.5% per annum is possible into the future. A 2% growth rate is probably at the upper end of the spectrum unless there is rapid change in the policy/economic environment in which Cuba operates. At a conservative 0.5% per capita growth rate, total final energy consumption is expected to grow by 3,270 KTOE by 2010 and by 4,374 KTOE by 2015. Making some assumptions regarding the role of biomass in future energy supply, this increase translates into 75,000 b/d of oil by 2010 and 104,000 b/d by 2015. This could be met with even modest success in the exploration and development of Cuba’s energy sector. Greater expansion of Cuba’s own oil industry could mean that further production increases could result in a reduction in the amount of oil imported. Cuban waters also house natural gas resources. There may be significant amounts of additional gas in offshore areas adjacent to areas off the southwest coast of Florida. The gas is in deep water and would require the expertise of international, and mostly U.S. oil companies to be developed. If this gas is developed, Cuba could substitute some natural gas for oil imports if investments were made in the industrial and electricity sector to burn gas. Moreover, depending on how much natural gas is found and developed, Cuba could become a source of gas exports to Florida, competing there with imports of LNG. Even given a modest growth in per capita income, Cuba will need to invest in additional electricity production and refineries. Both of these areas represent potential opportunities for foreign investors. Finally, Cuba is well situated to become a storage and distribution entrepot for oil and natural gas coming into the U.S., Mexico and Latin America. Thus, Cuba’s energy sector would likely see higher growth as well as attract increased foreign investment, were U.S. economic sanctions to be eased. Such ties would enhance US energy security by diversifying regional sources for petroleum product and oil and gas export supply. 1. The authors thank the Cuba Policy Foundation for support of this research, and Kenneth Medlock for helpful comments and assistance. 2. Because income is highly correlated with time (in most countries), use of a time trend to account for technological change produced statistically insignificant coefficients for either the time trend or income variable.